A new Xenomorph threat rises in Aliens Defiance #1, when Colonial Marine Zula Hendricks, accompanied by a squad of Weyland-Yutani synthetic security drones, embark on a mission to salvage a derelict space hauler – the Europa. With the discovery of a lethal Alien infestation on board, Private First Class Zula Hendricks becomes caught up in a voyage across space to destroy the Xenomorphs and save humanity. Brian Woods brings his distinct storytelling style to the Aliens franchise, in Aliens Defiance #1, with art by Tristan Jones and colors by Dan Jackson, this brand new Dark Horse comic book series piles on the mystery and acid blood splattering action to bring a very unique kind of bug-hunt to the Aliens mythology. Our introduction to Zula Hendricks is skilfully handled, her recover from a serious spinal injury is told via a series of flashbacks to events on Tranquility Base on the Moon, while her mission in the present day to recover flight data from the Europa for Weyland-Yutani builds the tension perfectly as Private Hendricks and the corporate security drones begin to explore the derelict vessel. Brian Woods engineers the tension and suspense perfectly, the characterization of Hendricks and her synthetic companion is gradually established and cleverly drives the narrative, but it is when the Xenomorphs start to emerge from the darkness and the synthetic screams begin ringing out across the ship that the thrills and chills really kick into overdrive. The artwork by Tristan Jones melds the tone of the original Alien film with the bombastic action of its sequel Aliens, and the results are quite startling. There are few moment where the characters proportions and expressions do seem a little bit off, but on the whole this is a very impressive looking issue. There are some nice throwbacks to the past as well, particularly those early scenes on the bridge of the Europa, there’s a chance meeting on Tranquility Base, and the closing moments in the iconic computer room and the messages on the screen are sure to bring some pangs of nostalgia. Tristan Jones makes the Aliens look incredible and as scary as hell, and the superb colors by Dan Jackson in these scenes also gloriously enhance the action. Initially, this first issue of Aliens Defiance does feel a little predictable. Familiar Alien tropes are rolled out to tick all the right boxes in all the right places for us, but it’s when the story suddenly goes off on a completely different tangent at the midway point that it will really surprise you. From there it will have you hooked every step of the way as its intriguing premise unfolds. Even though artificial life forms going bad in the Aliens franchise is nothing new, we’ve never seen anything done quite like this before, and that’s what makes Aliens Defiance feel all the more exciting and different. 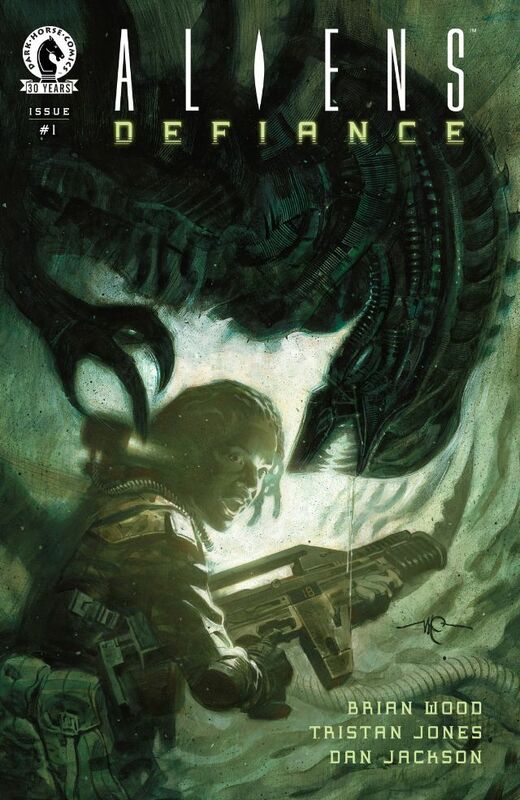 Aliens Defiance #1 provides a good start to this new Dark Horse series, with its exciting storyline by Brian Woods and impressive artwork by Tristan Jones, there’s plenty of potential here for a really fresh and different take on the Aliens franchise.